America is now energy independent. We now export oil and natural gas. This gives us some degree of leverage against what used to be the monopoly held by OPEC (The Organization of the Petroleum Exporting Countries). Yesterday Townhall posted an article that illustrates the influence America now wields because of its energy independence. 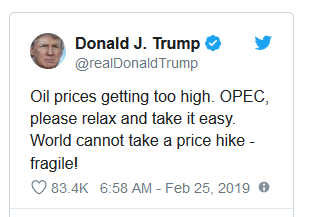 In the midst of the oil price spike scare, President Donald Trump warned the Organization of Petroleum Exporting Countries (OPEC) on Monday to “take it easy” on raising the price of oil. So what were the consequences of this tweet? Since this morning, the price of crude oil dropped by more than a dollar per barrel in just an hour. Bloomberg reported today that New York saw a 2.7 percent decrease in oil prices, which is the lowest drop in two weeks. “Analysts attributed the price rise to improving trade talks between the U.S. and China, unrest in Nigeria and Venezuela, Libya’s refusal to restart production in the El Sharara oil field and continued efforts to curtail supplies by OPEC and Russia,” according to The Daily Caller. When you don’t have to depend on OPEC for oil to keep your economy going, you have much more power to negotiate oil prices. On Monday, Investor’s Business Daily posted a commentary on the current global oil market. The commentary noted that Russia has been working with OPEC (Organization of the Petroleum Exporting Countries) to cut oil production in an effort to keep oil prices artificially high (after all– it worked in the 1970’s). Despite an uptick in oil prices, a closer look at the oil market unveils the real winner of curtailing crude exports: America. U.S. oil output broke through the 10 million barrels a day mark for the first time in half a century. And, according to a recent statement by the Director of the International Energy Agency, it could reach a record of 12.1 million barrels a day in 2023. Although the price of a barrel of oil has somewhat retreated from the January $70 heights, it is still $10 above its level a year ago and more than double what it was during the price collapse in early 2016. This has been helped along by phenomenal discipline within OPEC+, as the agreement on production cuts between OPEC, Russia and nine more exporting countries is informally known. Apparently compliance has reached a surprising 138% — exporters have made bigger cuts than initially pledged. The details of this show that one reason for the drop in production is the collapse of Venezuela‘s oil industry. Last year oil production in Venezuela shrunk by 20 percent– roughly 500,000 barrels a day. When the government nationalized the oil rigs in Venezuela, they had no idea how to maintain the rigs and maintain production, so production has continued to drop since that takeover. What has happened (and is happening) in Venezuela is a living example of the fact that socialism does not work. Arguably, leaders of the Gulf states and Russia are falling victim to politics, a field in which it’s better to be seen doing something than nothing. Especially when no one is sure what (if anything) would work. But who is the biggest economic winner in this game? Ironically, it’s America yet again. Each time Saudi Arabia and their allies restrict exports, they prop up the price and create a vacant market share which then gives a boost to those producers outside the agreement that are not bound by quotas. The biggest among them is the United States. Naturally, thousands of American companies are keen for a free ride. All of that is happening already. The U.S. has just overtaken Saudi Arabia in oil production and is expected to rival Russia soon. No wonder U.S. oil companies were expected to be especially cordial with the Saudi delegation during the princely visit. But one might imagine that on the sidelines of the meetings many Saudis will be scratching their heads and wondering how and why did they get themselves into this pickle. America needs to be energy independent. It allows us to be in control of the fossil fuel that is the backbone of the current world economy. The 1970’s proved that was important. With the lifting of many of the restrictions on domestic oil drilling (and fracking) in America, the impact of American oil and natural gas on the world market has grown. Today Reuters posted an article about the impact of American energy on the global oil market. …“It has had incredibly positive impacts for the U.S. economy, for the workforce and even our reduced carbon footprint” as shale natural gas has displaced coal at power plants, said John England, head of consultancy Deloitte’s U.S. energy and resources practice. The article notes that in an attempt to stop American energy development, OPEC (Organization of the Petroleum Exporting Countries) tried to discourage shale production of oil in America by flooding the market with oil (Saudi Arabia also played a role in financing movies and advertising containing misinformation about fracking). Energy independence is important for America. Total energy independence will have a very positive impact on our foreign policy. Because tyrannical regimes in the Middle East have traditionally controlled the oil supply to the rest of the world, western countries have been required to support governments they should not be supporting in order to keep the oil flooding. Russia is another country that has used its pipelines to Europe as a way to control certain European countries. Energy independence will give America a degree of freedom we have not had for a long time. Hopefully we will use that freedom wisely. One America News posted a story today about a comment made by Mohammad Barkindo, OPEC secretary-general. OPEC and other oil producers may need to take “some extraordinary measures” next year to rebalance the oil market, the OPEC secretary-general said on Sunday. “There is a growing consensus that … a rebalancing process is under way. We are gradually but steadily achieving our common and noble objectives,” Mohammad Barkindo told reporters at the India Energy Forum organized by CERAWeek in New Delhi. “To sustain this into next year, some extraordinary measures may have to be taken in order to restore this stability on a sustainable basis going forward,” he said, without elaborating. Saudi Arabia and Russia helped secure a deal between the Organization of the Petroleum Exporting Countries and 10 rival producers to cut output by about 1.8 million barrels per day (bpd) until the end of March 2018 in an effort to reduce a glut. Barkindo said consultations were under way for the extension of the OPEC-led pact beyond March 2018 and that more oil producing nations may join the supply pact, possibly at the next meeting of OPEC in Vienna on Nov. 30. He also said that Nigeria and Libya, who are exempted from the pact, “are making progress towards full recovery” of production, after which they could join the OPEC-led agreement. Translated loosely, there is a glut of oil on the world market, and the price has dropped. America is less dependent on foreign energy and has even been an exporter of crude oil since 2014 (see article here). The noose around America’s neck that OPEC exploited in the 1970’s no longer exists. OPEC will attempt to put that noose back, but I think it is too late. Generally speaking, the countries that have been hurt by the drop in oil prices are not countries that celebrate freedom for their citizens–Russia and Venezuela to name a few. American energy independence is a good thing–both for America and for the world. Yesterday Investor’s Business Daily posted an editorial about the current price of oil. Any person familiar with basic economic theory understands the law of supply and demand. When there is a lot of something, the price goes down. When something is scarce, the price goes up. Some of our recent political leaders missed this point, but we are now seeing the principle of supply and demand at work in the oil industry. Energy: Last week Royal Dutch Shell (RDSA) told investors that it expects oil prices to be “lower forever.” We’re still waiting for all those people who were only recently complaining about higher-forever oil prices to admit their mistake. Renewable energy, he said, was the only way to solve the “problem” of high oil prices. Domestic oil production was skyrocketing even as Obama made those remarks — thanks to advanced drilling technologies that have opened up vast new domestic supplies to production. The Energy Information Administration projects that, next year, U.S. oil production will average almost 10 billion barrels a day, which would beat the previous record of 9.6 billion in 1970. What’s more, a quarter of this production is coming from one oil field: the Permian Basin in West Texas. Those “obscene” industry profits? They’ve fallen as well. ExxonMobil’s (XOM) revenue in 2016 was about half what it was in 2011. In its most recent quarter, the company earned $3.4 billion — or 78 cents share. In the same quarter in 2011 it earned $10.7 billion, or $2.18 a share. Oil companies for a time even had to borrow money to pay dividends. Low oil prices have also led to a sharp drop in the taxes paid by the industry to the federal government. In 2016, the federal government collected about $6 billion in royalties, rental costs, and other fees from oil production on federal lands. That’s down from $14 billion in 2013. Now Shell is saying that it’s bracing for low oil prices forever. Lower energy prices have a positive impact on the American economy–consumers have extra money to spend, it is cheaper to manufacture goods here, and tourist-related industries thrive when Americans can travel and not worry about the cost of fuel. Even if the current oil glut causes some pain to the oil industry and crimps tax revenues, it is good news for the economy, since lower energy prices reduce the cost of doing business across the board, and make the U.S. a more-attractive place to do business on a global scale. But it does raise some important questions: Where are those people who were screaming about Big Oil? Why aren’t they being asked to explain how they could have been so wrong? And just who, exactly, was being stupid? Economic principles work–every time they are allowed to. But sometimes things in real life have a domino effect. We are seeing that effect in some recent seemingly unrelated moves by the Trump Administration. One of the immediate changes that took place when President Trump took office was the lifting of many regulations regarding energy production and energy exporting in the United States. That was the first domino. What seemed to be a national issue is now going to have major international implications. On Tuesday, Bloomberg News posted an article predicting an agreement between the Trump Administration and Poland that would allow Poland to begin importing natural gas from America. That is the second domino. Polish leaders are betting Donald Trump’s visit to Warsaw starting on Wednesday, two days before the U.S. president meets his Russian counterpart, will bolster their efforts to reduce the nation’s dependence on natural gas from its eastern neighbor. Less than a month after Poland’s Baltic Sea terminal received its first shipment of U.S. liquefied natural gas, a spot cargo from Cheniere Energy Inc.’s Sabine Pass plant in Louisiana, authorities in Warsaw are mooting ambitious plans. The ideas range from a long-term gas deal with U.S. producers to infrastructure projects linking east European nations reliant on supplies from Moscow-based Gazprom PJSC. America’s vast energy resources have the potential to change world politics–from OPEC to Russia’s blackmail of Europe by threatening to cut off the gas supply. I suspect we are going to see a log more dominoes fall in the future. Investor’s Business Daily posted an article today about the recent influences on oil prices. As the mad dash back to the U.S. oil patch has even global oil giants like Chevron (CVX) and Exxon Mobil (XOM) turning their focus to shale, U.S. oil production is on pace to exceed peak production levels in July and could hit 10 million barrels per day in August. Those milestones loom as OPEC and top non-OPEC producers weigh whether to extend by another six months their agreement to reduce output by 1.8 million barrels a day. The cartel’s next meeting is scheduled for May 25. The initial pact reached late last year lifted oil prices and encouraged U.S. producers to pump more oil. The extra supply has since weighed on prices, which have fallen more than 10% since the start of the year. But hedges allowed U.S. firms to lock in the higher, earlier prices, and they have continued ramping up output. U.S. crude futures sank 4.8% to settle at $45.52 a barrel on Thursday, plunging to a five-month low and dropping below the price seen before OPEC reached its production pact in late November. The result of developing American energy independence by developing America‘s fossil fuel resources is lower fuel costs for Americans, better national security for Americans, and a better negotiating position with the ‘oil bullies’ of the world. There may come a day in the future when green energy is the dominant energy source, but right now the world economy is essentially based on fossil fuel. Until someone comes along and invents a green energy source that can provide energy 24 hours a day and be cost effective, the world will revolve on fossil fuel. Because our economy is based on fossil fuel, it is good to have some leverage against those who are able to deny their citizens basic human rights without being challenged because they have a monopoly on fossil fuel. Bloomberg is reporting today that OPEC (organization of the Petroleum Exporting Countries) has agreed to cut oil production beginning in January. The market has already reacted, and crude prices have climbed to $50. That means that the price of a gallon of gasoline will be going up, heating oil will be going up, and the cost of electricity may also be affected. However, there is a bright side to this. One of the things to expect in a Trump Administration is the development of America‘s gas and oil resources. The Obama Administration has blocked that development wherever possible. Theoretically, the price increase along with the end of some regulations could create energy independence for America. This would have a drastic impact on our foreign policy. There is, however, more to the picture. In the past when OPEC has seen America moving toward energy independence, they have dropped the price of oil so that development of America’s oil reserves did not make financial sense. It will be interesting to see if they do that again. We also need to remember what the impact of American energy independence will do to the world market of oil. If America can reach a point where it exports oil, OPEC will no longer be important. It will be interesting to see at what point practicality on the part of OPEC overcomes immediate greed. Their immediate greed will encourage the growth of the American energy market. Practicality would keep prices low so that America had no incentive to develop its resources. Bloomberg Business is reporting today that the Organization of the Petroleum Exporting Countries (OPEC) may boost oil production dramatically after the sanctions are lifted on Iran. The global oil market is already in surplus by about 3 million barrels a day, with Saudi Arabia and Iraq responsible for OPEC’s oversupply in the past six months, Iran’s state-run Islamic Republic News Agency reported Sunday, citing Mehdi Asali. Iran can boost output by 500,000 barrels a day within one week after sanctions are lifted, Oil Minister Bijan Namdar Zanganeh said earlier this month. …Iran made a “big mistake” when it backed OPEC’s decision in December 2011 to discard individual production quotas, Asali said. That allowed Saudi Arabia, Kuwait and other members to take over Iran’s share which was diminishing because of sanctions, he said. …Brent oil futures closed at $49.19 a barrel on Friday, down 14 percent for this year. We have seen this play before. There is an oil price at which fracking, a major part of American oil and natural gas production, is no longer profitable. To restart a fracking operation after it has been suspended is expensive and cumbersome. The easiest way to prevent America from becoming energy independent is to drop the price of oil as America begins to develop her oil and natural gas resources. This severely impacts the development–American businessmen are in business to make money. If fracking is not profitable, they will not invest the money to do it. OPEC would very much like to keep America dependent on their oil. Our dependency on OPEC oil has a tremendous impact on our diplomatic policy in the Middle East. We give money to and support in other ways countries whose basic ideas and values are in total conflict with our own. It would be very nice to be energy independent and be able to make decisions on international matters according to our principles–not our dependence on oil. The New York Post posted a story today about a federal report stating that fracking does not harm drinking water. I suspect this is going to be a problem for many environmentalists. It will be interesting to see how they react to the study. In their report, federal researchers studied the entire fracking process, from the acquisition of water to the disposal of wastewater. Prompted by Congress, researchers reviewed thousands of pages of studies and conducted their own investigations of fracking, which collects natural gas and petroleum deep below the surface. Before releasing the report, the feds sought comment from the public, industry officials, states, Indian tribes and nongovernmental organizations. The report identified factors to consider: whether an area has enough water for people’s needs as well as fracking; spills; accidental injection into drinking-water sites; well failure; subsurface migration of gases and liquids; and inadequate or poorly treated wastewater. The American Petroleum Institute, an industry trade group, said the study was a validation of the safety of fracking. When attempting to evaluate this report, consider the fact that a lot of the anti-fracking movement is funded by OPEC (Organization of the Petroleum Exporting Countries). Obviously they have a vested interest in preventing America from developing her oil resources. Breitbart.com reported yesterday that according to a draft of its long-term strategy report, The Organization of the Petroleum Exporting Countries (OPEC) has admitted that their war on shale oil production in America has failed. There are a few interesting things in this article. First of all, developing America’s oil resources and decreasing America’s dependence on foreign oil will have a serious impact on American foreign policy. It should eventually allow America to support freedom and human rights in places where these are not currently practiced. Second of all, there is an economic benefit to developing oil resources in America–not only does it bring down the cost of gasoline internationally, if the exporting of these products is allowed, it will strengthen the American economy. Thirdly, it is interesting that OPEC did everything it could to discourage American oil production. The admission of that fact should give pause to those people who blindly signed on to the anti-fracking movement without checking their facts. America is capable of leading the world economically. We are a country rich in resources and rich in talent. What we have lost in recent years is our morality and our work ethic. We need to regain both of those in order to achieve economic success. Fox Business posted a story today by Maria Bartiromo. The story included an amazing statement by Saudi billionaire businessman Prince Alwaleed bin Talal. The Prince stated that we will never see $100 a barrel oil again. Saudi Arabia and all of the countries were caught off guard. No one anticipated it was going to happen. Anyone who says they anticipated this 50% drop (in price) is not saying the truth. Because the minister of oil in Saudi Arabia just in July publicly said $100 is a good price for consumers and producers. And less than six months later, the price of oil collapses 50%. Having said that, the decision to not reduce production was prudent, smart and shrewd. Because had Saudi Arabia cut its production by 1 or 2 million barrels, that 1 or 2 million would have been produced by others. Which means Saudi Arabia would have had two negatives, less oil produced, and lower prices. So, at least you got slammed and slapped on the face from one angle, which is the reduction of the price of oil, but not the reduction of production. This is an interesting situation–the Saudis kept the production up so the price would go down. This seriously impacted the economies of Iran, Russia and Venezuela, and indirectly Cuba. It also made oil production in America less attractive–smaller profits. If the Saudis cut production to raise the price, American production comes back up and reduces the price. 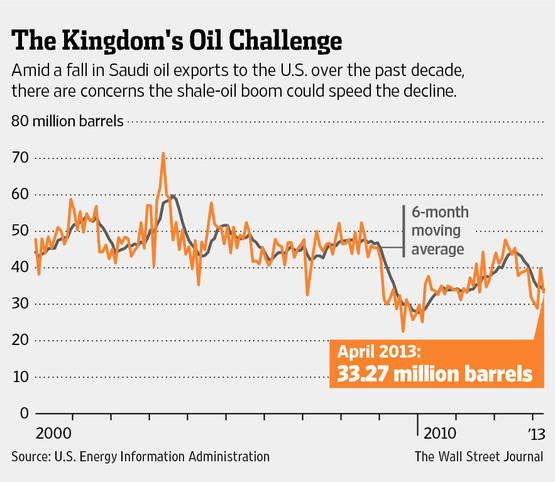 If the Saudis keep the price low, American production will be less, but will still exist. I love the idea that we will never again see $100 a barrel oil. I am tired of being blackmailed by the Middle East oil producers. Maybe now we can stop funding terrorism. American oil production is not the entire reason for lower gas prices, but it is one of the causes. Regardless of the price, America needs to be energy independent. Because the most practical energy in use right now is carbon based, we need to be carbon-based energy independent. Steven Hayward posted an article at Power Line today about the recent drop in oil prices. As of 4 pm today, oil was listed at about $58 a barrel. So what does this mean? Our Rate of Return (ROR) drops to 10% on our wells at $55 oil. However, this assumption assumes no drop in costs to drill wells and no contraction in the large differential ($10 to $12 per barrel) between Bakken and WTI oil. In reality our ROR would actually be above 10% at $55 WTI oil price as our costs to drill would also come down. There are plenty of drilling locations that would have above 10% ROR at $40 oil. Even more drilling locations would require $70, $80, or $90 oil prices for that ROR. Of course, drilling will slow down long before you get down to a 10% ROR. Most will want at least a 20% ROR. Of course the quality of the operator matters in addition to the drilling location. . .
Bottom line is that the Saudis want to chill investment in new oil supply to help protect OPEC’s future. In round numbers we have had about 5 MBOPD increase in world oil demand over the last 5 or 6 years. Over the same time period US oil production has grown from nearly 4 MBOPD (from 5 to 9 MBOPD) — 80% of the increase in WORLD demand! This is NOT good for OPEC. I suspect that we will have ugly oil prices ($60 – $75) for around a year as that is long enough to stop many current oil supply investments and, more importantly, serve to chill the appetite for future large investments in oil supply growth (deep water, arctic, marginal shale, marginal tar sands, etc) which is the Saudi goal in my opinion. I do not believe that the current price ($65) is a sustainable price going forward. It would not encourage enough new supply to balance world demand which itself would be goosed upwards with the lower prices. I suspect that after this ugly price period ends, we likely see oil bouncing around the $75 to $95 range or something like that. Of course all of this depends on the state of world economy which has many significant challenges such as at the required unwind, or more likely significant revamping, of the unsustainable entitlement states over the next two decades. I personally believe that the Euro currency was a very idea from the start and is damaging for Europe and unsustainable as an institution. The unwind of the Euro within the next 5 or 10 years could also cause significant economic headwinds for the world economy. This game has been played before–when America is reaching energy independence, lower the price to avoid further exploration. We are fools if we fall for this. As soon as OPEC thinks America is not interested in developing its own resources, the price will go back up to where it has been in recent years. Regardless of the price, energy independence is always a good idea for security reasons. Energy independence also frees America up to support democracies in the Middle East rather than dictatorships. The Wall Street Journal today included an article by Daniel Yergin about the falling oil prices. The Organization of the Petroleum Exporting Countries (OPEC) met Thursday and decided not to cut oil production. That is a major policy change and will have worldwide impact. The demand for oil is no longer the basis for OPEC’s decisions–now the deciding factors are the surge in U.S. oil production and the new oil supply from Canada. Oil is currently selling at about $69 per barrel after hovering around $100 per barrel for the past three years. The shale oil being drilled in America is still economical to produce with prices between $50 and $69 per barrel, so the lower prices will not drive America from the world market. So what are the international implications of cheap oil? The Russian budget is funded over 40% by oil, but Putin has built up a reserve of a few hundred billion dollars that will help Russia cope with the falling oil prices. Venezuela and Iran are also negatively impacted by falling oil prices. Just for the record, the building of the Keystone XL Pipeline would have a severe negative impact on the Venezuelan economy–the Gulf Coast refineries would replace the heavy oil from Venezuela with the Canadian oil. There is, of course, the possibility that OPEC could change its mind in the Spring and cut output, but even if they were to do that, they would only be hurting themselves, as Canada and the United States would simply increase their production to make up the difference. Are You Enjoying The Current Price Of Gasoline? On Sunday, Stephen Moore posted an article at The Daily Signal about the recent decline in gasoline prices. 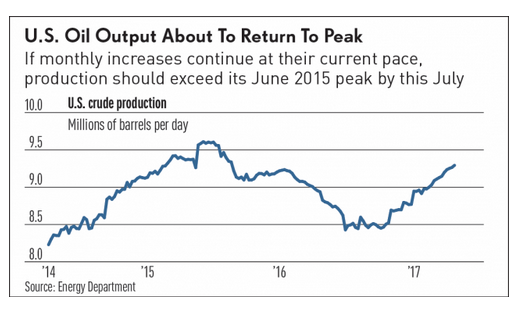 The article reminds us that in June, oil reached a peak price of $103 a barrel. Since then, the price has dropped 25 percent. American motorists are seeing the results of that drop in gasoline prices at the pump that have dropped below $3.00 per gallon. At their present levels, gasoline prices are saving American consumers and businesses $200 billion a year. Oil prices are falling because of changes in world supply and world demand. Demand has slowed because Europe is an economic wreck. But since 2008 the U.S. has increased our domestic supply by a gigantic 50 percent. This is a result of the astounding shale oil and gas revolution made possible by made-in-America technologies like hydraulic fracturing and horizontal drilling. Already thanks to these inventions, the U.S. has become the number one producer of natural gas. But oil production in states like Oklahoma, Texas and North Dakota has doubled in just six years. Without this energy blitz, the U.S. economy would barely have recovered from the recession of 2008-09. From the beginning of 2008 through the end of 2013 the oil and gas extraction industry created more than 100,000 jobs while the overall job market shrank by 970,000. President Obama, you didn’t build this recovery (such as it is)–it happened in spite of you! The energy blitz in America is breaking the back of OPEC. They can no longer blackmail western countries with threats of cutting off their oil supply. Yet the political class still doesn’t get it. As recently as 2012 President Obama declared that “the problem is we use more than 20 percent of the world’s oil and we only have 2 percent of the world’s proven oil reserves.” Then he continued with his Malthusian nonsense, “Even if we drilled every square inch of this country right now, we’d still have to rely disproportionately on other countries for their oil.” Apparently, neither he nor his fact checkers have ever been to Texas or North Dakota. And we don’t have 2 percent of the world’s oil. Including estimates of onshore and offshore resources not yet officially “discovered”, we have ten times more than the stat quoted by the president–resources sufficient to supply hundreds of years of oil and gas. If the President and his Democrat allies would get out of the way, the American economy would recover. Please remember that when you vote next week. The Middle East oil countries have done very well during the past thirty or so years. The have combined to form the Organization of the Petroleum Exporting Countries (OPEC) and have raised the price of oil from somewhere near $5 a barrel to over $100 a barrel (although the cost of oil is currently dropping). The Wall Street Journal reported today that as the Western countries begin to develop their oil resources, OPEC members are fighting over production quotas and prices. But even modest cooperation between many members has broken down, and Saudi Arabia, in particular, has moved to act on its own. While it cut output earlier this summer, other members didn’t go along. Since then, it has dropped its prices. Each member has a different tolerance for lower prices. Kuwait, the United Arab Emirates and Saudi Arabia generally don’t need prices quite as high as Iran and Venezuela to keep their budgets in the black. Late Friday, Venezuelan Foreign Minister Rafael Ramirez, who represents Caracas in the group, called for an urgent meeting to tackle falling prices. The group’s next regular meeting is set for late next month. But on Sunday, Ali al-Omair, Kuwait’s oil minister, said there had been no invitation for such a meeting, suggesting the group would need to stomach lower prices. He said there was a natural floor to how low prices could fallat about $76 to $77 per barrel—near what he said was the average production costs per barrel in Russia and the U.S. The history of oil prices has often been that when the Middle East begins to drop their prices, Americans stop looking for cheaper oil in their own country. Considering the current instability in the Middle East in the OPEC nations, that would be a big mistake. America needs to be energy independent for both economic and security reasons. It is time to develop our own resources. The Organization of Petroleum Exporting Countries (OPEC) is meeting this week. The Financial Times reminds us that oil prices have dropped from $128 a barrel in March to a current price of about $100. The drop is partially due to the financial difficulties in the European Union and the general slowdown in the world’s economy. Normally when the price of oil drops, OPEC calls for a decrease in production so that the price will rise again (supply and demand works!). Recently OPEC has been producing more oil than its quota in an effort to lessen the impact of the oil sanctions that Europe and America have placed on Iran in an attempt to end Iran’s nuclear program. Saudi Arabia seems to be responsible for the increase–Ali Naimi, Saudi Arabia’s oil minister, told the Financial Times in March that he would like to see lower oil prices “that will not hurt the global economic recovery”. The Saudis have called for higher oil output levels despite the lower prices. I would love to be a fly on the wall (one who understood whatever language is spoken) at the coming OPEC meeting! American Industry Triumphs–Even When It Is Not Allowed To ! There is something very ironic about this story. One of the reasons that the American economy is recovering so slowly is the high price of gasoline. That price is pretty much set by OPEC (made up of countries that generally do not like us) and the falling value of the American dollar. One of the solutions to that particular problem would be for America to develop its own oil resources and become energy independent. The Obama Administration has done a fairly good job of blocking any attempt to make that happen (offshore drilling, drilling in ANWR, Keystone pipeline, etc.). American oil companies have been limited in where they can explore for oil and where they can drill. Because American oil companies are in business to make a profit, they are going elsewhere! Breitbart.com reported yesterday that Exxon Mobil has been hired by Russia to drill for oil in the Arctic Ocean–you know–up where the Obama Administration prevented Americans from drilling. Think about how backward things are under Obama—the largest oil company in America is going to be drilling in waters around the Arctic where they expect to find 85 billion barrels in recoverable oil. And instead of sending it to Texas refineries, and thereafter to gas stations across America, the oil will be sent to Russia and refined for their use. By the way, if extracted at the rate of 1 million barrels a day, 85 billion barrels of oil would last for 85,000 days. 85,000 days equals well over 200 years. Yet here we are, listening to Obama telling us the future is one of wind farms, electric cars, and a companies like Solyndra. Perhaps we’ll get lucky and Russia will sell us some of their oil. If Obama keeps us in this energy stranglehold we’re going to need it. 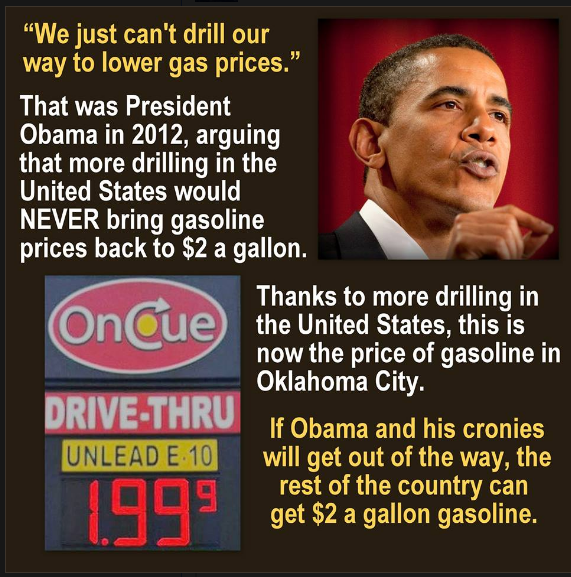 It seems that one of the casualties of the Obama Administration’s energy policy is common sense. Iran Is Ramping It Up–Is Anyone Listening ? My Way posted a story today about Iran’s warning to the other oil-producing countries in the Gulf not to boost their oil production if Iran’s oil production is reduced because of western sanctions. Iran’s OPEC governor made the threats just as Saudi Arabia announced that it would increase its oil production if Iran’s oil production decreased. Saudi Arabia, the Arab world’s largest economy, is widely seen as the main counterweight to Iran in the region. Any attempt by Iran to close the Strait of Hormuz, through which a sixth of the world’s oil flows, would also affect the export abilities of the major Gulf producers, including Saudi Arabia, Iraq, the United Arab Emirates, Kuwait and Qatar. While momentum appears to be building for the sanctions by the West, China, another major buyer of Iranian oil, has come out against the measures. Wen said the two sides “should expand trade of crude oil and natural gas and energy-related cooperation as to deepen their energy partnership,” Xinhua reported. There are a couple of things going on here. First of all, America is vulnerable to this sort of garbage from Iran because we have not developed our own energy resources. Second of all, young Iranians (who make up more than half of the country) do not support the current government of Iran. A war against the Americans would allow the rulers to unite the country against a common enemy (us) in order to stay in power and continue their nuclear program. Third, Russia and China will support any action by any country that creates a problem for America. The weaker we become, the stronger they have a chance to become. Fourth, can you imagine the bully Iran will become when it completes its nuclear program? Part of the problem here is America’s failure to become energy independent and part of the problem here is that the Iranians see President Obama as a weak President that they can push around. Neither one of these things is good for the future of America. If the voters are smart, we will have a new President in 2013. Saturday’s Wall Street Journal posted an article about Harold Hamm, the Oklahoma-based founder and CEO of Continental Resources, the 14th-largest oil company in America. He was the original discoverer of the gigantic and prolific Bakken oil fields of Montana and North Dakota that have already helped move the U.S. into third place among world oil producers. Evidently President Obama is blinded by the fact that many of his friends and major financial supporters have substantial investments in green energy. There is nothing wrong with green energy, but right now we have a need for oil and gas. It is a shame that our President is so blinded by self-interest that he is unwilling to address that need.